Participating in Activities…is it Dementia Therapy? The Alzheimer research described below tells us YES – using appropriate dementia activities is a successful therapy for patients with Alzheimer's and other types of dementia; it can be more effective than medications. A person with a condition causing physical weakness, such as arthritis, does exercises to maximize their physical strength. So is the case for people with dementia, who have a cognitive weakness. Exercising the affected brain by using capabilities that remain will maximize cognitive functioning. See below for the research and how you can start a mental stimulation - or activity - program at home. Staying active with dementia slows the progression of the disease, improves quality of life, maintains abilities and improves communication. Activities for dementia work as well, if not better, than medications. A 2012 review of multiple research trials of cognitive stimulation activities with dementia patients, like puzzles, games, and reminiscing, showed a benefit in maintaining their thinking and daily living abilities. The benefits were greater than any medication effects. In addition, there was an improved quality of life for the person and an increased ability to communicate. Current available drug treatments have shown only modest effects in slowing the progression of dementia. However, a recent study of an Alzheimer's activity therapy program given along with routine dementia drugs to nursing home patients with dementia, was effective at stopping the dementia from progressing further. In addition, participants were able to keep doing their everyday tasks. Effects of the therapy program lasted for at least 12 months. In contrast, the control group of patients who took only the routine dementia drugs, but did not receive the activity therapy, had their dementia progress. Have a consultation with a dementia care occupational therapist, who can evaluate the person's capabilities and recommend specific activities that will work. Speak to the physician for a referral. Choose a time of day to do the activity program. Consider what time of day is best for the person. Often times, it is in the morning. Consider what 'activity level' the person is at and determine what types of activities may be appropriate. Learn the person's activity level. 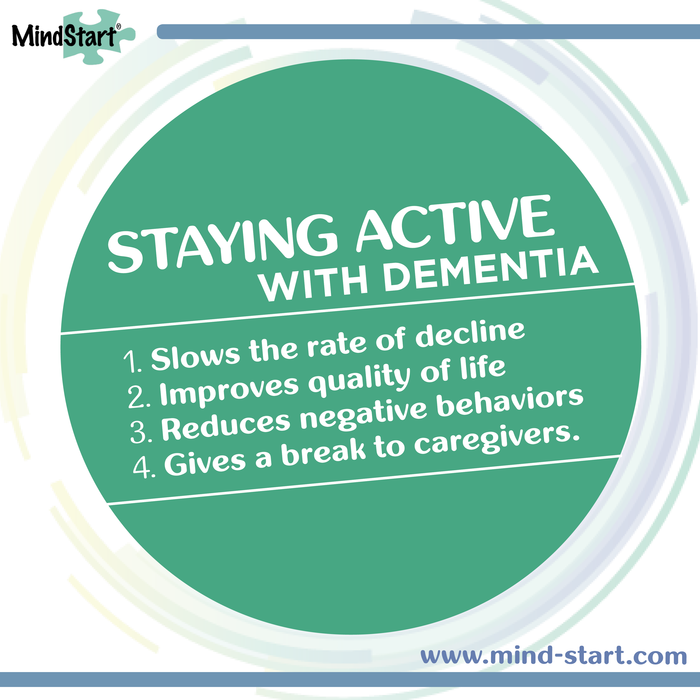 How long the person stays engaged in the activities may depend on their level of dementia. Those with more severe dementia will have shorter attention spans. However, when the right type of activity is chosen and the right caregiver support is in place, often patients can be engaged for an hour or so. Consider the different types of activities that can be provided, such as physical, cognitive, spiritual, etc. See the types of activities to consider. MindStart large piece puzzles, dementia games, and This Is My Life memory book, are all good fits to cognitive stimulation, or activity, programs and can provide the right amount of cognitive stimulation, as shown below. Research shows MindStart activities can be completed more independently be persons with dementia, with less caregiver oversight required. 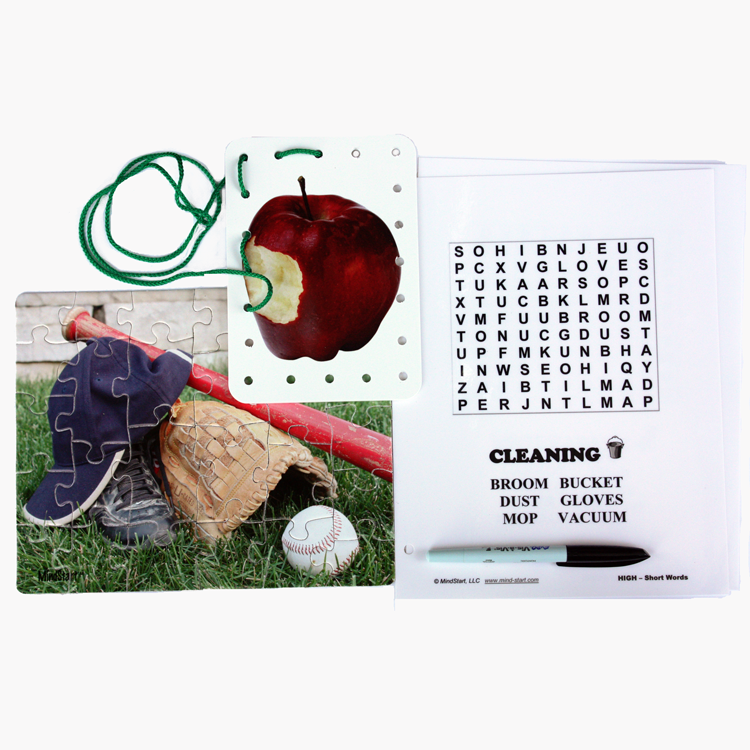 MindStart offers the only comprehensive line of activity products designed for and tested with people with Alzheimer’s or other dementia. MindStart products are designed by an occupational therapist and have simplifications built into them. They provide mental stimulation without being too difficult. In fact, a research study completed at the University of Minnesota showed the MindStart dementia products are easier to complete than standard dementia products used in memory care. 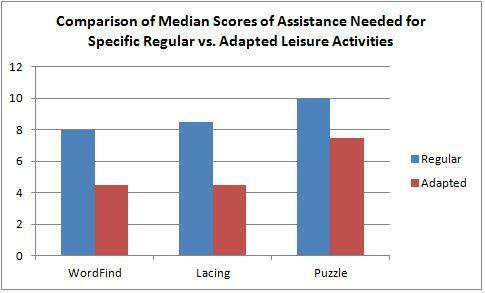 The table below shows how much assistance was needed for the patient with dementia to complete a standard activity product used in dementia care (shown in blue) compared to a MindStart product (shown in red). The results show that the patient can do the MindStart activities with less assistance, providing feelings of success for the person and requiring less oversight by the caregiver. MindStart activities are a perfect fit for providing dementia activity therapy.